This past Saturday, at the star-studded Global Citizen Festival, Google's Made with Code initiative unveiled a new project. After Metallica's spirited performance, 'Quantico'-star Priyanka Chopra, a host of the evening, was joined on stage by a legion of teen girls. "The girls you see on stage and screen are coding to fight inequality, to increase peace, and to end poverty," Priyanka explained. She then motioned to the jumbotrons behind her which lit up with colorful shapes, iconography, and cartoon animals. Each image featured text that proclaimed a political, social, and/or environmental message like: "Love Our Animals," "Protect Our Nature," " Support All Women." 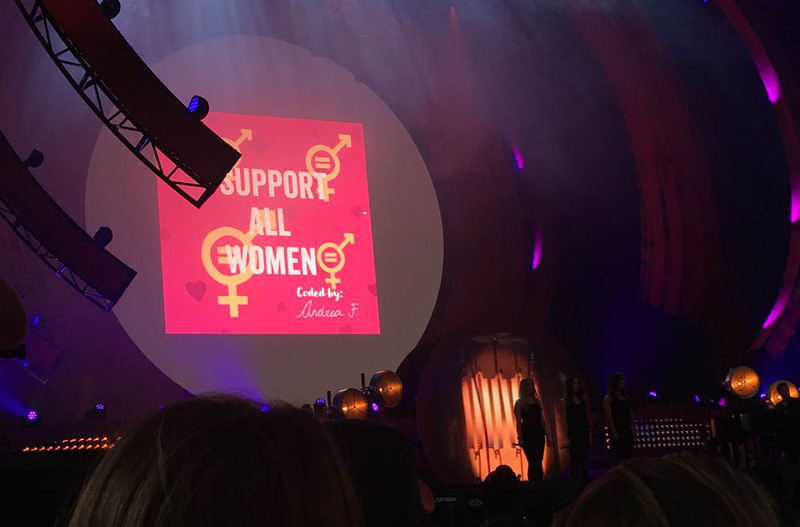 Priyanka Chopra and the girls of Made with Code on stage at The Global Citizen Festival. Courtesy of Made with Code. "Behind me," Priyanka continued, "you will see the hopes and aspirations written and designed with code of girls and young women using their voices to make a difference," She then went on to introduce Ellie Goulding who performed her biggest hits with the girls' work displayed behind her. What happened on stage is only half the story though. Backstage were some of the individuals working to make such a powerful presentation possible. For each featured image, there were a million more created by teen girls across the world using Made with Code's "Change" App. The "Change" app was designed around a larger goal: to encourage today's youth to become the computer scientists of tomorrow. It uses drag-and-drop functionality to create a fun jigsaw-esque programming platform that offers coding challenges for beginner and junior coders. Young participants in Made with Code's programs also owe much to their mentors, women who are recruited for their knowledge, caring, and ability to connect a technical skill set with opportunities in the real world. One of the mentors, Fereshteh Forough, is an Afghan refugee who founded her company, Code To Inspire, to educate Afghani women in technology and entrepreneurship. Fereshteh hopes that her students will go on to thrive in society "without being worried of physical or geographical distances. They come online, they work online, and they get paid online." Displayed on the Jumbotron is one of the millions of images coded by girls around the world. Photo taken by Alex Schattner. Another mentor, Rose Broome, is the founder of HandUp, a digital platform that helps users donate money to the homeless people featured on its profiles. Instead of the money going directly into a featured person's pocket, it is given to the shelter he or she belongs to, and used for the legitimate purposes of their choosing (ie. clothes, food, rent). So far, HandUp has partnered with shelters in 25 cities to provide local facilities with global awareness and assistance. "My favorite part is impacting someone else's life," Rose says, "We have all this technology and innovation, and yet we have people sleeping on the street at night... I wanted to help somebody, and I thought there had to be an easier way to do that. So, I told myself I was going to do something for homeless people. I started working on HandUp as a side project and then it just took off. Now I have two co-founders, and its a five-person team. I was telling the girls at the lunch [earlier] that when you use code, a small team can make something that can scale, and be deployed in many cities." With such good mentors on its side, and a dedication to helping young women advance in the growing field of technology, Made with Code shows exciting promise. And like Ellie Goulding sang, "Anything could happen."